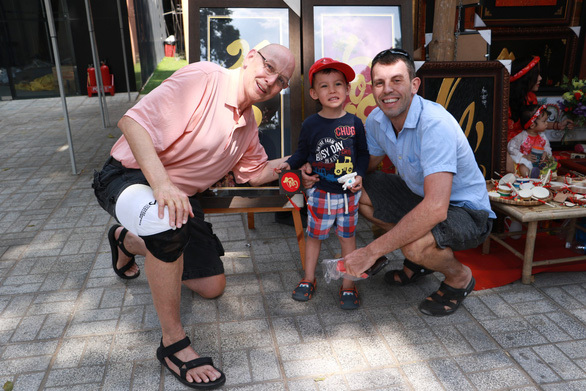 Many foreigners have engaged themselves in the Vietnamese traditions of celebrating Tet (Lunar New Year), including buying and hanging folk paintings and calligraphical works, as they were spotted among locals at an event being held in Ho Chi Minh City on the weekend. As Tet is only one week away, Vietnamese people are gearing up for shopping for the most anticipated holiday in the Southeast Asian country. Apart from buying food, clothing items and floral embellishments for the upcoming Tet, many also choose to purchase calligraphical works and Tet paintings. These Tet items are being put on sale during an annual event taking place at the Ho Chi Minh City Youth Culture House in District 1 on Sunday, attracting not only local residents but also foreign visitors, some of whom were seen wearing ao dai, or Vietnam's traditional long gown. Calligraphical works are those featuring stylized words in Vietnamese, Chinese and even English or any other language that one’s heart desires. The content, usually wishes, quotes or verses, is written in the form of calligraphy with a brush using a special kind of ink. In the good old days, Tet was when ong do, a Vietnamese noun referring to male teachers usually of a senior age, would make calligraphical works upon people’s request. The tradition is today revived, with young calligraphers acting as ong do and selling their works. 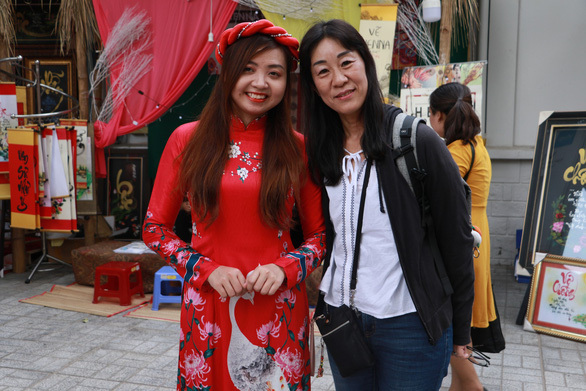 At the event in Ho Chi Minh City, known as Pho Ong Door ‘The Street of Ong Do,’ many ong do in their 20s or 30s in ao dai were busy writing words to sell to their customers. 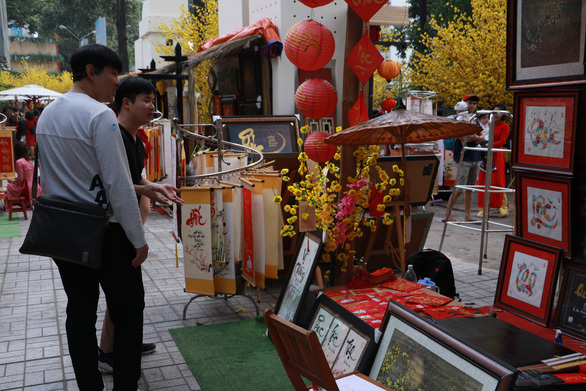 Thanh, a young ong do, said that foreign visitors, mostly Chinese, Japanese and South Koreans, buying calligraphical works has become a common scene at the event in recent years. They often prefer asking ong do to do ‘English versions’ of the most common calligraphed words available in Vietnamese. Words like Happy New Year, Lucky or Lucky Money are most commonly requested by international visitors, whereas red envelopes and small-sized greeting cards featuring content in calligraphy are the best-sellers. Pho Ong Do is among the busy gathering places in the southern metropolis in the lead-up to Tet, which starts on February 5, as visitors come not only for the calligraphical works but also for some Tet-themed photos. Rhys, a British national, said he was visiting Pho Ong Dofor the first time, despite having lived and worked in Ho Chi Minh City for seven years. 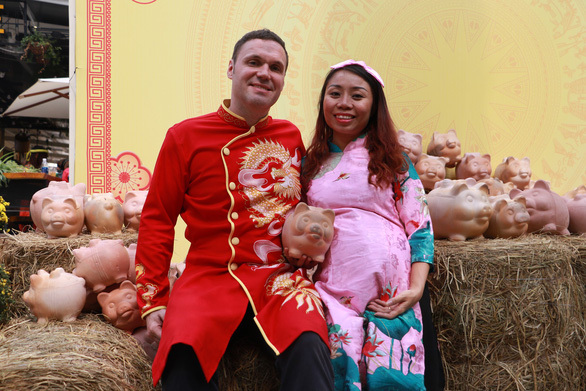 The Briton, sporting a special ao dai with dragon prints, was touring the street of ong do with his Vietnamese wife on Sunday morning. Rhys said he had donned this special gown in his wedding, also held as per Vietnamese tradition, two years ago. 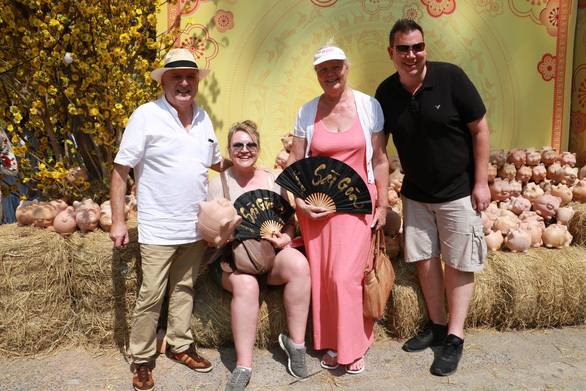 Like Rhys, Sebastian, a businessman from Austria, decided to extend his business trip in Ho Chi Minh City to experience the Vietnamese Tet atmosphere for the first time, after having been to the city for several times. “I like to learn about Asian cultures, among which Vietnam is one of the countries that left me with the most special feelings,” Sebastian said. He said that what make foreign tourists love Vietnam are the gentleness, hospitality and sincerity of local people, which stay in international visitors’ memory after they leave the Southeast Asian country. “I like the way Vietnamese people appear in traditional costumes, especially the women,” Sebastian added. “They look different, graceful and charming, unlike when they wear everyday office clothes,” the Austrian businessman underscored.